The Ritz-Carlton hotels of Asia Pacific are set to hit a new milestone this week for Smile Asia – a global alliance of independent charities, as it launches its fourth regional fundraiser program which will bring total funds raised to US$1.5 million. 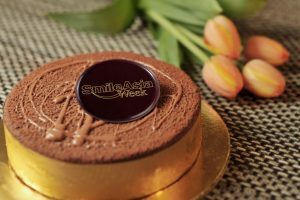 Smile Asia Week runs from May 8 to 14 and sees specially-crafted cakes sold to raise funds for the international medical charity which provides children with cleft lips or palates a reason to smile again. All 24 Ritz-Carlton hotels in Asia Pacific are participating with over 10,000 ladies and gentlemen lending their skills and passion to their community and guests. Pastry chefs of The Ritz-Carlton in each country designed their recipes for the cake sale, taking into account local variations in taste and preference. In mainland China, Hong Kong, Macau and Singapore, Valhrona Chocolate and Banana Cake was chosen, reflecting the universal popularity of chocolate to bring a smile to everyone’s face and banana being a flavor that appealed to children and adults alike. All cakes are sold exclusively through the website www.smileasia.org. The celebration cakes can be used to celebrate special occasions amongst family and friends from Mother’s Day to anniversaries and birthdays. The website also allows friends and family from across the world to send the cake to their loved ones and friends in Asia and have it delivered. All proceeds go directly to the charity and will be used to send medical volunteers on surgical missions across Asia. A portion of the proceeds from Smile Asia Week in 2016 will be used to provide Plastic Surgery Fellowships to two deserving doctors from the Kingdom of Bhutan in 2017. This would be the first such initiative supported by Smile Asia, which is aimed at long-term self-sufficiency of countries where there is a lack of qualified professionals. Ladies and gentlemen from The Ritz-Carlton hotels of Asia are also continuously participating in medical mission trips to remote locations across countries in Asia as nonmedical volunteers this year. They are lending their hands in numerous tasks, including setting up of surgery stations, patient registrations, patient management, etc. to aid the success of each Smile Asia mission. To date, the funds raised in three years totaled $ 1,250,154 to support almost 1,515 operations and the contribution in 2017 is expected to be even higher, to help bring a total fund raised in four years to achieveUS$1.5 million.